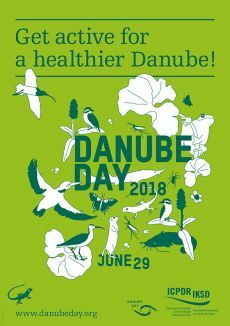 Get active for a healthier Danube in Bavaria and Baden-Württemberg! Bavarians got active at two days of festivities including a mass litter-pick in Neuburg, a mass river swim at Ingolstadt and accessible tours of the floodplain forest at Schloss Grünau. Environment Minister Huber signed a declaration creating a ‘human-free’ Danube island. The 2018 Art for the Danube - Danube Art Master competition asked young people from Bavaria to consider how they would help the Danube. Children from 12 schools responded by presenting environmental messages through video and riverside artworks. Exciting prizes included an animation workshop with TrickFilmStudio and art workshop with land artist, Christina Diana Wenderoth. Check out Bavaria's competition website and facebook to view the winning entries. In Baden-Württemberg, the International Danube Festival opened with a parade of 650 vibrantly coloured flags representing Danube diversity, designed by Serbian and Croatian artists. During the festival, visitors could explore large-scale interactive models to learn more about rivers: how they form and change over time, how to prevent flooding and even how they feel between your toes! Among the river exhibits was a giant sand box demonstrating how flowing water forms a river channel and a bare-foot water path so you can experience the materials that make-up the riverbed. Experts also led tours of the new flood protection scheme. Visit the Donaufest website and Donau Büro website, twitter feed and facebook page for more details. To see how all the countries celebrated in 2018, go to Review 2018. You can also revisit 15 years of German Danube Day celebrations via the general Review page. Heide Jekel of the Federal Ministry for the Environment, Nature Conservation and Nuclear Safety on +49 228 99 305 2521; Heide.Jekel@bmu.bund.de or view the ministry calendar of events. Thore Gauda of the Bayerisches Staatsministerium für Umwelt und Verbraucherschutz on +49 (0)89 9214 – 4369; Thore.Gauda@stmuv.bayern.de. See also the ministry's website for further information. Ute Hellstern of the Regierungspräsidium Tübingen on +49 7371 187 – 338; Ute.Hellstern@rpt.bwl.de. See also the websites of the Regierungspräsidien Baden-Württemberg and Regierungspräsidium Tübingen. See the Donaubüro website, facebook and twitter feed.